La semana recién finalizada tuvo como noticia principal en Trinidad, la realización de la segunda vuelta en la elección de Delegados de la Asamblea Municipal del Poder Popular en 6 circunscripciones del municipio. De esta manera se completaron los 92 Delegados que integrarán el máximo Órgano de Poder Estatal de Trinidad, la cual quedará constituida el venidero 17 de diciembre, según dispuso el Consejo de Estado de la República de Cuba. The week just ended had the main news in Trinidad, the completion of the second round in the election of Delegates of the Municipal Assembly of People’s Power in 6 districts of the municipality. In this way, the 92 Delegates that will be part of the highest State Power Body of Trinidad, which will be constituted on December 17, according to the State Council of the Republic of Cuba, were completed. La semana anterior, el pueblo de Trinidad de Cuba rindió homenaje al Comandante en Jefe Fidel Castro Ruz, y a los héroes y mártires de la Patria, al cumplirse 28 años del regreso a Cuba de los restos mortales de los combatientes internacionalistas caídos en defensa de la libertad de pueblos del continente africano. De esta manera se rememoró la Operación Tributo, efectuada el 7 de diciembre de 1989, y se desarrolló una ceremonia militar en el cementerio municipal, con la presencia de familiares de los héroes y mártires trinitarios. The previous week, the people of Trinidad de Cuba paid tribute to the Commander in Chief Fidel Castro Ruz, and to the heroes and martyrs of the Nation, on the 28th anniversary of the return to Cuba of the mortal remains of the internationalist combatants who had fallen in defense of the freedom of peoples of the African continent. In this way, Operation Tribute was recalled on December 7, 1989, and a military ceremony was held in the municipal cemetery, with the presence of relatives of the trinitarian heroes and martyrs. Durante esta semana, la ciudad de Trinidad y su Valle de los Ingenios celebraron los 29 años de la inclusión de estos lugares como Patrimonio Cultural de la Humanidad, por la Organización de las Naciones Unidas para la Educación, la Ciencia y la Cultura, UNESCO. Diversas actividades festejaron esta fecha, entre ellas, el festival de las artes organizado por la Oficina del Conservador, que incluyó teatro, humor, danza, artes plásticas, música y otras manifestaciones. During this week, the city of Trinidad and its Valley of the Mills celebrated the 29th anniversary of the inclusion of these places as World Cultural Heritage, by the United Nations Organization for Education, Science and Culture, UNESCO. Various activities celebrated this date, among them, the festival of arts organized by the Office of the Conservator, which included theater, humor, dance, plastic arts, music and other events. The Municipality of Trinidad, which includes the town of Trinidad and other population centers, has about 67,000 inhabitants in an area of about 434 square miles, equivalent to a square about 20 miles on a side. The town of Trinidad was the fourth of seven cities founded by Diego de Velásquez, in 1514. 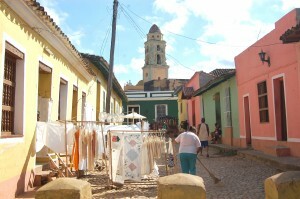 It is unique in Cuba, being one of the two cities in this hemisphere designated as a World Heritage Site by UNESCO. Trinidad is located on the south shore of Cuba, a little to the west of center. Its historical integrity is protected by its designation as a national monument by Cuba. As a result, it is virtually free of concessions, souvenir shops and billboards, and restoration has been quite rapid due to UNESCO funding. It is perhaps the best restored city in Cuba. Not surprisingly, tourism is its major industry now, and it has been described as a ‘must see’ site. But the tourist who visits Trinidad is not the tourist who visits urban Havana. The attractions of Trinidad are not urban, but historical and cultural. Though tourism is very prominent, farming, mainly of sugar, coffee and cattle as well as fishing are important to the economy as well. There is also a developing lobster fishery, which is selling on the international market. Trinidad was used by Cortes to provision his conquest of the Aztecs, was later home to smugglers and pirates (being far from the authorities in Havana by sea), was prominent in the slave trade and more recently, in the 19 th century, was the thriving center of Cuba’s sugar production and trade – based in part on the abundance of slave labor. Many Mainers, including prominent Portland families and many Maine mariners had connections with Trinidad and the sugar trade. Trinidad is famous for its cobblestone streets, paved in part with stones carried as ballast in ships from Maine. The nearby Valle de los Ingenios – the valley of the Sugar Mills – itself a UNESCO World heritage site at the foot of the Sierra del Escambray; a magnificent nearby four kilometer long white sand beach, Playa Ancón; and the beauties of old Trinidad itself all make the area a treasure.